The idea behind our Real Letterbox service is simple in itself. We enable you to read real postal mail from the Internet. We do this by providing you with a postal address to which you can have your letters sent, we scan your mail when it arrives into PDF documents you can then download and read your mail from our website. Your mail is stored securely on our site and available to you after being scanned 24/7. We have tried to keep our interface familiar. If you have used email clients or web based email before the PC2Paper Real Letterbox service should be no different to you. We enable you to see letters you have written and mail you have received all in one place. Currently we have two pricing plans for our Real Letterbox service. Occasional User - You pay £29.99 per year and pay for mail as it arrives. If you don't want to read an item of mail you are not charged for it. Regular User - You pay £60 a year and get 30 items of mail (maximum of 60 pages) included free each month. Before we activate your Real Letterbox account we will require 2 forms of identification be sent through to us. These can be a copy of a drivers licence, passport and a credit card or a utility bill at your current address. Look at our pricing plans first and then sign up for a PC2Paper account. 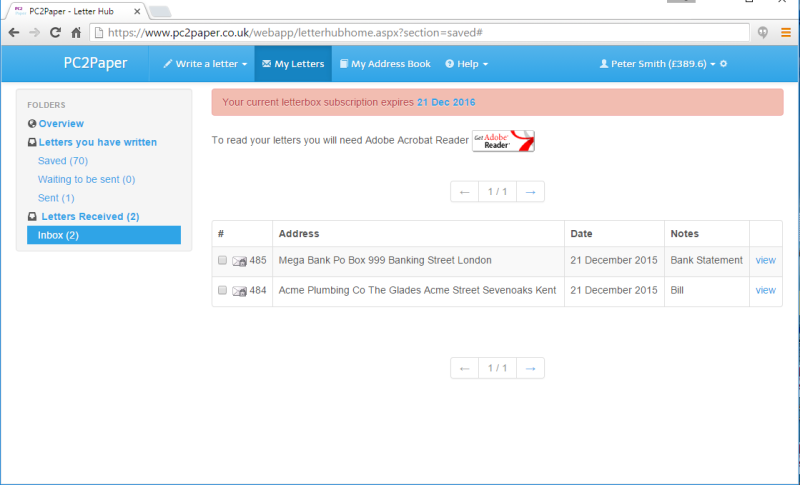 From within your PC2Paper account you can then choose which Real Letterbox service you would like to subscribe to. Additionally you can use your PC2Paper account for sending letters from the Internet. If you have any questions you may found our Frequently Asked Questions sections may hold the answer.